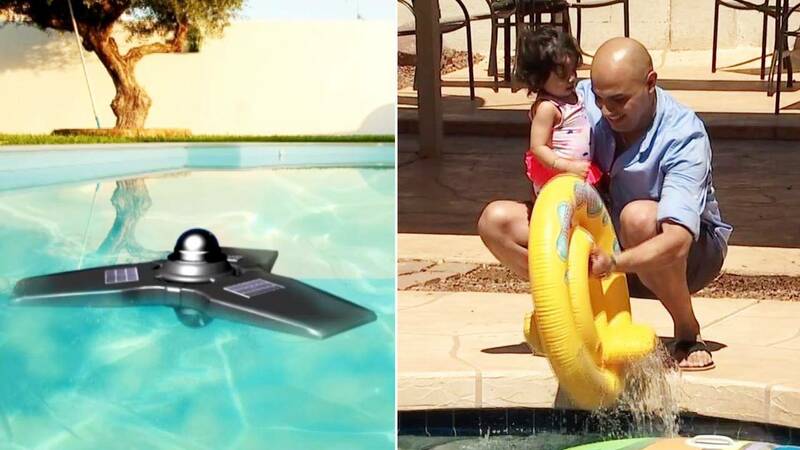 An Arizona dad has created a drone to monitor pools after he was saddened by recent news stories of local children drowning over the summer. Lee Kambar, of Phoenix, is the inventor of the Morningstar, a drone that floats on the surface of the pool. Using 360-degree cameras, one positioned above the surface of the water and one below, and facial recognition software, the drone sends a notification and live stream through an app when it detects activity in the pool. The minute they approach the pool, it will send you a notification saying [someone is] by the pool, Kambar told KPHO. Then you get a second notification from the bottom camera showing you a live image inside the pool of your kid dealing with a crisis. If the image shows someone in trouble, he can easily contact emergency responders by sending a picture and alert through the app. While Morningstar is not a substitute to constant supervision, Capt. Jake Van Hook of Phoenix Fire said it can make a difference when it comes to their response to drownings. Every second counts in these situations, Van Hook said. Aside frombirth defects, drownings are the leading cause of death for children between the ages of 1 and4, according to the CDC. Van Hook explained there havebeen 27 drowning calls and sixdeaths in Phoenix this year. There's a certain level of emotion that's stirred when you know you're going to a drowning and it's a child, Van Hook said. It takes an impact on you. You feel that you sense that loss. Thats when Kambar decided to take action. A light bulb went off in my head; there's a problemlet's find a solution to it, he said. Our kids are the most valuable thing to us as parents, and for such a tragedy to occur, it's unnecessary. Kambar estimates the Morningstar, priced at less than $1,000, will hit the market by the end of the year.